The induction of immunologic unresponsiveness by i.v. administration of Ag-coupled lymphoid cells has been studied extensively, but the mechanisms remain unclear. We have further explored this model by examining the role of Fas/Fas ligand (FasL)-mediated apoptosis. Using i.v. injection of trinitrophenyl-coupled splenocytes (TNP-spl) as tolerogen, we found that Fas signaling for apoptosis in the spleen cells delivered by FasL in the recipient is the critical event. The requirement for Fas and FasL was overcome by prior induction of apoptosis in TNP-spl, making the tolerogen 100 times more potent. Prevention of apoptosis by a caspase inhibitor blocks tolerance. Interestingly, while blocking CD40/CD40 ligand interaction does not prevent tolerance induction, an agonist anti-CD40 Ab turns tolerogenic TNP-spl into an immunizing Ag. Studies further showed that tolerance is induced through cross-presentation of Ag in a class I MHC-dependent manner by CD8+CD11c+ lymphoid-derived dendritic cells to regulatory T cells. The results provide a mechanism for a well-established method of inducing immunologic unresponsiveness. The induction of Ag-specific unresponsiveness (or tolerance) in adult individuals has been achieved through a variety of approaches. One such approach, introduced in 1966 (1), involves the i.v. injection of haptenated splenocytes. This method results in significant inhibition of cell-mediated immune responses (e.g., contact hypersensitivity) to the hapten. The resultant state of unresponsiveness can be transferred with CD4+ and/or CD8+ T cells (2, 3, 4). Similar levels of tolerance have been achieved using large protein (5) and peptide (6) Ags. Although this system has been widely studied, the mechanism for induction of this form of tolerance remains obscure. It is thought that tolerance induced by haptenated spleen cells is related to the route of administration, the dose of Ag, and/or the availability of costimulators. The route is clearly important, as the same dose of these Ags given i.v. induces tolerance but the same dose given s.c. induces immunity (3). This suggests that the presence or absence of costimulation is unlikely to be the only determining factor. Another critical factor seems to be the lymphoid organ that takes up the Ag. The spleen has been shown to be of critical importance, as it is more difficult to tolerize splenectomized animals (1, 4). Still another observation is that the tolerance can be split, i.e., Ab and CTL responses can be unaffected, while only delayed-type hypersensitivity responses are tolerized (7). The lpr and gld mutations affecting Fas (CD95) and its ligand (Fas ligand (FasL),4 CD95 ligand), respectively, produce a lymphadenopathy in mice that is associated with acceleration of autoimmune responses (8). The finding that Fas/FasL interactions are required for efficient activation-induced apoptosis in T cells in vitro (9), and for peripheral T cell deletion in vivo (10), suggests that defects in apoptosis contribute to lymphoid cell accumulation and autoimmune dysfunction. These mutations also affect tolerance induction in some systems (11, 12, 13), thereby implicating Fas/FasL interactions in other forms of tolerance. Recently, the uptake of apoptotic cells by dendritic cells was shown to direct associated Ags to the class I MHC presentation pathway allowing cross-priming of CD8+ T cells (14, 15, 16, 17). The uptake of apoptotic cells has been suggested to prevent maturation of dendritic cells to an immunostimulatory state, as well as to promote tolerance induction (18). In this work we relate Fas-mediated apoptosis of haptenated splenocytes, uptake by dendritic cells, and cross-priming of CD8+ T cells to the induction of unresponsiveness in mice. Furthermore, we show that the transfer of such unresponsiveness requires both CD4+ and CD8+ T cells, and that the former can be replaced by stimulatory anti-CD40 Ab. These results are discussed in terms of a model of adult unresponsiveness mediated by activated T cells, cross-primed to Ags on apoptotic cells. C57BL/6 (B6) mice were purchased from the National Cancer Institute (Frederick, MD). B6-gld and B6-lpr we bred in our own facility from strains originally obtained from The Jackson Laboratory (Bar Harbor, ME). β2-microglobulin (β2m) knockout mice were purchased from The Jackson Laboratory. 2,4,6-Trinitro-1-chlorobenzene (TNCB) was purchased from Eastern Chemical (Smithtown, NY). 2,4,6-Trinitrobenzene sulfonic acid (TNBS) was purchased from Sigma-Aldrich (St. Louis, MO). Anti-CD11c-FITC and anti-CD8α-PE were purchased from BD PharMingen (San Diego, CA). Anti-CD8α (clone 53.6.7) and anti-CD4 (clone RL574) supernatants used for cytotoxic depletion were obtained from the laboratory of Dr. P. M. Stuart (Washington University, St. Louis, MO). Pooled rabbit complement was purchased from Pel-Freez Clinical Systems (Brown Deer, WI). ZVAD-fmk was obtained from Calbiochem (San Diego, CA). Anti-CD-40 (FGK45) and anti-CD40 ligand (CD40L; MR-1) Abs have been described (19). Mice received a single injection of 300 μg FGK45 or 250 μg MR-1 as indicated. Spleen cells were isolated from spleen and coupled with trinitrophenyl (TNP) as previously described (11). Briefly, 108 cells were incubated in 0.5 ml HBSS and 0.5 ml 10 mM TNBS for 7–10 min at room temperature. After incubation, cells were washed three times with HBSS before use. TNP-coupled splenocytes (TNP-spl) were irradiated unless otherwise indicated. TNP-coupled spleen cells were irradiated (3000 rad) or left untreated and injected i.v. via the retro-orbital plexus. Mice were immunized 48 h later with 0.05 ml of 1% TNCB in acetone/olive oil (3/1) applied to shaved abdominal skin. Five days later mice were challenged with 0.033 ml 10 mM TNBS in PBS in the right footpad and 0.033 ml PBS in the left footpad. Values are expressed in micrometers (± SE) and represent the difference between the right footpad (Ag challenge) and the left footpad (PBS challenge). Background values represent the difference between the challenged and unchallenged footpad in unimmunized mice. Spleens were removed and ground between the frosted ends of glass slides. All tissue was collected and centrifuged for 10 min at 200 × g. Pellets were resuspended in complete RPMI (RPMI 1640 supplemented with 10% FCS, l-glutamine, sodium pyruvate, penicillin/streptomycin/fungizone, HEPES, and 2 × 10−5 M 2-ME), along with 50 μg/ml collagenase type 2 (Worthington Biochemical, Lakewood, NJ), and 0.02 μg/ml DNase I (2 ml/spleen; Roche, Indianapolis IN). This mixture was placed in a 37°C/5% CO2 incubator on a rotator for 45 min. EDTA (10 mM) was then added and the cell suspension was incubated for an additional 10 min. The cell suspension was then washed three times with HBSS and RBCs were lysed with a Tris-lysing buffer. Cells were then placed in 100 × 20 mm tissue culture dishes (Corning, Corning NY) at an equivalent concentration of one spleen (108 cells) per dish in 5 ml of complete RPMI and placed in a 37°C/5% CO2 incubator for 1.5 h. Dishes are swirled twice at 30-min intervals. Nonadherent cells were collected, and the plate was washed with Ca2+/Mg2+-free HBSS and placed at 4°C for 30 min. Adherent cells were then harvested with a cell scraper. Following washing with Ca2+/Mg2+-free HBSS, cells were stained with anti-CD8α-PE (BD PharMingen) and anti-CD11c-FITC (BD PharMingen) on ice for 30 min. Cells were then washed two times with Ca2+/Mg2+-free HBSS and subjected to cell sorting with FACSVantage (Beckman, San Jose, CA). Cell sorting was performed based upon staining for CD8α-PE and CD11c-FITC, resulting in four populations: CD8α−CD11c−, CD8α+CD11c−, CD8α+CD11c+, and CD8α−CD11c+. The adherent cell fraction was consistently 2–3% of the total cells isolated from the spleen. The four sorted populations were injected i.v. into mice at the equivalence of one spleen per recipient. Spleen cell suspensions were prepared as described above. Following collagenase/DNase treatment, 5 × 106 cells in 1 ml of complete RPMI were placed in the wells of a 24-well plate and incubated for 2 h at 37°C in a 5% CO2 incubator. Wells were then washed three times with HBSS to remove nonadherent cells and 1 × 106 irradiated TNP-spl were added per well in complete RPMI. Following 2 additional hours of incubation at 37°C, wells were washed three times with Ca2+/Mg2+-free HBSS and the plates were placed at 4°C for 30 min. Cells were dislodged with a cell scraper, washed again in HBSS, and counted, and 1 × 104 viable cells were transferred to naive mice. Mice were immunized with TNCB as described above. Twenty-four hours following i.v. injection of irradiated TNP-spl, spleen cell suspensions from tolerized mice were prepared as described above. Following collagenase/DNase treatment, cells were resuspended in complete RPMI and placed in 100 × 20 mm tissue culture dishes (Corning) at an equivalent concentration of one spleen (108 cells) per dish in 5 ml of complete RPMI. Dishes were incubated for 2 h at 37°C in a 5% CO2 incubator. The nonadherent cells were removed, the dishes were washed three times with HBSS, and 1 × 106 irradiated TNP-spl were added per well in complete RPMI. Following 2 additional h of incubation at 37°C, wells were washed three times with Ca2+/Mg2+-free HBSS and the plates were placed at 4°C for 30 min. Cells were dislodged with a cell scraper and washed in HBSS. Naive recipient mice received the equivalent of one spleen’s worth of adherent cells, nonadherent cells, or unseparated spleen cells. Mice were immunized with TNCB as described above. T cells were isolated from spleen cells suspension as previously described (20, 21). Briefly, 5-ml econocolumns (Bio-Rad, Richmond, CA) were filled with glass beads (mean diameter: 200 μm) coated with normal mouse Ig. The columns were washed three times with HBSS followed by the addition of a 1/6 dilution of rabbit anti-mouse Ig. After a 1-h incubation, the column was washed three times with HBSS. Spleen cells (108/2.5 ml beads) were added to the column with a flow rate of one drop per 6–10 s. Cells were collected as they emerged from the column. Yields were typically 25–30% of the applied cells that consisted of 95–98% CD3+ cells. CD4+ and CD8+ T cells were obtained by negative selection. Purified T cells were treated with anti-CD4 (clone RL574) or anti-CD8 (clone 53.6.7) plus rabbit complement (1/16). Cells were transferred to recipient mice at equivalence, where each recipient mouse received the equivalence of one spleen’s worth of the appropriate cell population. We used a standard model of tolerance induction in which TNP-spl were injected i.v. (1). Two days later mice were immunized by skin painting with the hapten. Five days following immunization mice were challenged in the footpad and contact hypersensitivity was assessed 24 h later. As shown in Fig. 1⇓A, induction of a vigorous contact hypersensitive response in C57BL/6 (B6) mice was blocked by prior i.v. injection of B6 TNP-Spl. Tolerance in B6, lpr, and gld mice. A, B6, B6-lpr, or B6-gld mice were injected i.v. with 1 × 107 TNP-spl. B, B6 TNP-spl were treated with 1% paraformaldehyde or irradiated with 3000 rad before i.v. injection of varying numbers into B6 mice. C, B6 recipient mice were injected with B6 or B6-lpr TNP-spl, or varying doses of B6-lpr TNP-spl. D, TNP-spl from B6-lpr mice were irradiated and treated with ZVAD-fmk (100 μm) before injection (1 × 107 per recipient). Forty-eight hours following i.v. injection recipient mice were immunized with 1% TNCB on shaved abdominal skin. Five days later recipient mice were challenged with 10 mM TNBS in the right footpad and PBS in the left footpad. Measurements (micrometers ± SE) were taken 24 h later and represent the difference between right footpad (Ag challenge) and left footpad (PBS challenge). Background (Bkg) values represent the difference between challenged and unchallenged sites in naive mice. *, Significantly different from immune control. The role of Fas and its ligand in this effect was examined by using lpr and gld animals, which are functionally defective in these molecules (8). Fig. 1⇑A shows that i.v. injection of TNP-spl from wild-type B6 mice induced unresponsiveness in both B6 and Fas-defective B6-lpr recipient mice. In contrast, unresponsiveness was not induced with TNP-coupled lpr splenocytes, or when TNP-spl from wild-type mice were injected into FasL-defective gld mice. These results show that for unresponsiveness to occur in this system Fas must be present on the TNP-spl and functional FasL must be available in the recipient. One likely role for Fas/FasL interactions may be to induce apoptosis in the injected cells. To examine this possibility, nontolerogenic Fas-defective lpr spleen cells were coupled with TNP and then irradiated to induce apoptosis. Irradiation of either wild-type (Fig. 1⇑B) or lpr (Fig. 1⇑C) TNP-spl increased the potency of these cells for induction of tolerance. In contrast, TNP-spl fixed with paraformaldehyde (nonapoptotic) induced tolerance only at very high doses (Fig. 1⇑B). Apoptosis proceeds via the activation and function of a number of cysteine proteases, called caspases (22). Therefore, we examined the effect of the pan-caspase inhibitor zVAD-fmk on tolerance induced by irradiated TNP-spl. As shown in Fig. 1⇑D, zVAD-fmk treatment of irradiated TNP-spl completely prevented the induction of tolerance by these cells. These results suggest that the activation of caspases in TNP-spl was required for the induction of tolerance in this system. One role for caspase activation during apoptosis is the generation of cell surface signals that promote phagocytosis of the dying cell (22). Because the recipient spleen is important for tolerance induction by haptenated cells (1, 4), we examined this organ for phagocytic APCs that might transduce the tolerogenic signal by engulfment of apoptotic cells. As shown in Fig. 2⇓A, splenic adherent cells obtained from mice injected 24 h earlier with TNP-spl transduce tolerance when injected into naive mice, whereas the splenic nonadherent cells did not. We further analyzed the adherent cell population by examining expression of CD8α and CD11c, two markers that identify cells capable of cross-presenting Ags. 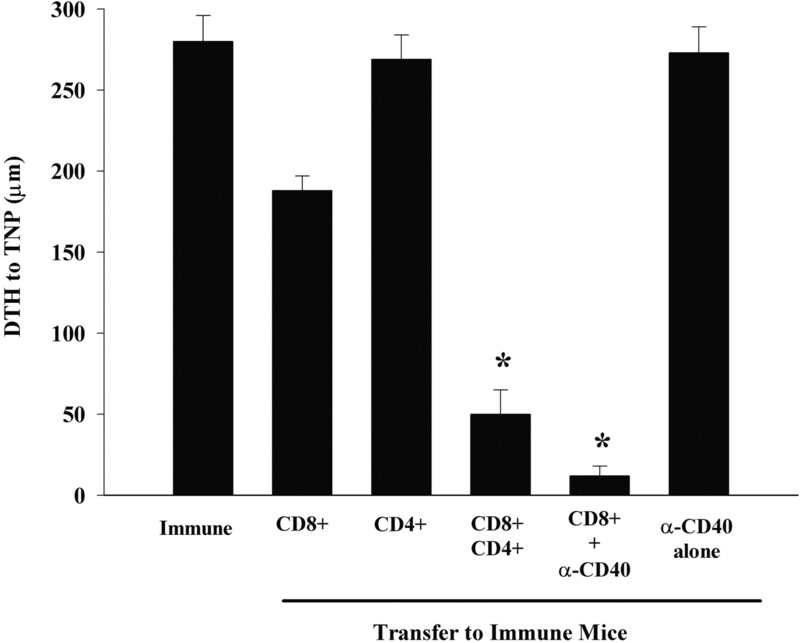 Cytotoxic depletion of CD8α+ cells from the adherent population with Ab and complement eliminated the ability of these cells to transfer tolerance (Fig. 2⇓B). To more precisely identify the splenic adherent cell population that transduced the tolerogenic signal, splenic adherent cells obtained from mice injected 24 h earlier with irradiated TNP-spl were sorted into four populations based on CD8α and CD11c staining (Fig. 3⇓A). Analysis of these populations by adoptive transfer revealed that only the CD8+CD11c+ (R3) cell population transduced the tolerogenic signal (Fig. 3⇓B). This is despite the fact that these cells comprise 2–3% of the splenic adherent population (Fig. 3⇓A). Further analysis revealed that only 25% of these CD8α+CD11c+ (or 0.5–0.075% of the total adherent cells) could be shown to have accumulated labeled apoptotic cells (data not shown). This is consistent with a recent report on the potency of these resident spleen cells for inducing biological activity (23). Splenic adherent cells transduce the tolerogenic signal. B6 mice were injected i.v. with 1 × 107 irradiated B6-derived TNP-spl. Twenty-four hours later recipient spleens were removed and the adherent and nonadherent cells were isolated. A, Naive B6 mice were then infused (i.v.) with one spleen equivalent of unseparated (Unsep), nonadherent (Non-adh), or adherent (Adh) cells. 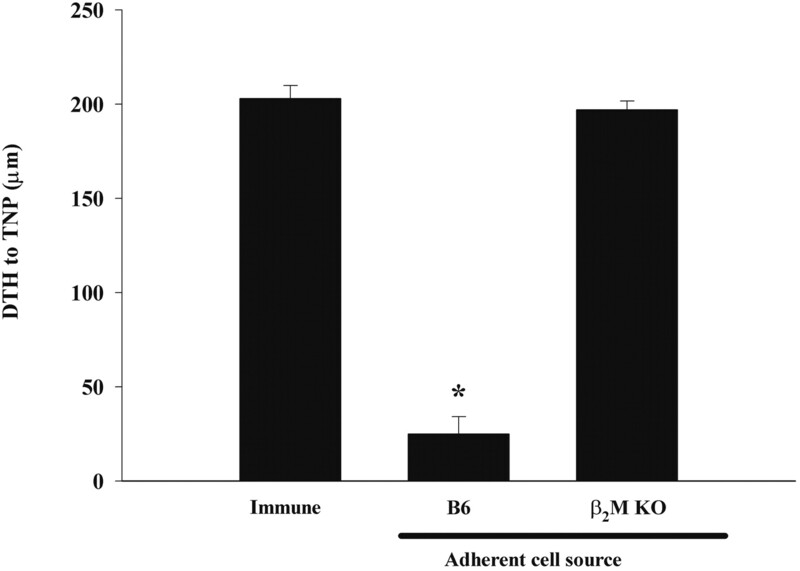 B, Adherent cells were treated with anti-CD8α plus complement before i.v. infusion. All recipient mice were immunized 24 h later with 1% TNCB on shaved abdominal skin. Five days later mice were challenged with 10 mM TNBS in the right footpad and PBS in the left footpad. Measurements (micrometers ± SE) were taken 24 h later and represent the difference between right footpad (Ag challenge) and left footpad (PBS challenge). Background (Bkg) values represent the difference between challenged and unchallenged sites in naive mice. *, Significantly different from immune control. Identification of the splenic adherent cell. Naive mice were injected i.v. with 1 × 107 irradiated B6-derived TNP-spl. Twenty-four hours later recipient spleens were removed and the adherent cells were isolated. Adherent cells were then sorted based on surface expression of CD8α and CD11c into four populations. A, Density plot of the CD8α, CD11c populations. R1, CD8α−CD11c−; R2, CD8α+CD11c−; R3, CD8α+CD11c+; and R4, CD8α−CD11c+. B, B6 mice were then infused i.v. with one spleen equivalent of the sorted populations. All recipient mice were immunized 24 h later with 1% TNCB on shaved abdominal skin. Five days later mice were challenged with 10 mM TNBS in the right footpad and PBS in the left footpad. Measurements (micrometers ± SE) were taken 24 h later and represent the difference between right footpad (Ag challenge) and left footpad (PBS challenge). *, Significantly different from immune control. Recent studies have suggested that a CD8αhighCD11c+ dendritic cell subset is responsible for cross-priming. This cell population comprises the lymphoid-derived subset of splenic APCs and is capable of moving extracellular Ags into the intracellular class I MHC presentation pathway (23). Data in Fig. 2⇑ demonstrate that the injected apoptotic cells enter the splenic adherent cell fraction for transduction of the tolerogenic signal. Therefore, we examined the possible role of class I-mediated cross-priming in this system by culturing splenic adherent cells obtained from uninjected mice with irradiated TNP-spl. Fig. 4⇓ shows that adherent cells from wild-type mice effectively transferred tolerance, whereas adherent cells from animals lacking class I MHC expression (β2m deficient) did not. This requirement for class I MHC and a role for CD8αhighCD11c+ cells are suggestive of a role for cross-priming of the phagocytosed hapten in tolerance induction in this system. Class I+ adherent cells transduce a tolerogenic signal. Adherent cells from B6 or β2m-deficient mice were fed 1 × 106 irradiated TNP-spl. Cells were dislodged and 1 × 104 viable cells were transferred to naive mice. All recipient mice were immunized 24 h later with 1% TNCB on shaved abdominal skin. Five days later mice were challenged with 10 mM TNBS in the right footpad and PBS in the left footpad. Measurements (micrometers ± SE) were taken 24 h later and represent the difference between right footpad (Ag challenge) and left footpad (PBS challenge). *, Significantly different from immune control. While our results are consistent with the idea that cross-priming is involved in this system, we were curious as to why the outcome of i.v. injection was tolerance and not immunity. Apoptotic cells do not activate the phagocytic cells that eat them, and dendritic cells that take up apoptotic cells do not trigger active immune responses. In fact, apoptotic cells have been shown to prevent the maturation of dendritic cells (18). Because ligation of CD40 on dendritic cells provides a potent activation signal (19), we examined the effect of activation of dendritic cells on tolerance induction in this system. As shown in Fig. 5⇓A, administration of an anti-CD40 agonist Ab converted the tolerogenic TNP-spl to an immunogenic signal. In contrast, blocking CD40/CD40L interactions with an antagonistic anti-CD40L Ab had no effect on the ability of TNP-spl to induce tolerance (Fig. 5⇓B). CD40 signals and tolerance. A, Naive mice received an i.v. infusion of 1 × 107 TNP-spl, TNP-spl plus anti-CD40, or anti-CD40 alone. Five days later mice were challenged with 10 mM TNBS in the right footpad and PBS in the left footpad. B, Naive mice received an i.v. infusion of 1 × 107 TNP-spl or TNP-spl plus anti-CD40L. Forty-eight hours later recipient mice were immunized with 1% TNCB on shaved abdominal skin. Measurements (micrometers ± SE) were taken 24 h later and represent the difference between right footpad (Ag challenge) and left footpad (PBS challenge). *, Significantly different from immune control. Tolerance induced by haptenated spleen cells can be adoptively transferred with T cells from the unresponsive animal (3, 24). Fig. 6⇓ shows that T cells from animals injected with TNP-spl 7 days earlier transferred unresponsiveness to naive mice, and this effect required both CD4+ and CD8+ T cells. The activation of a CD8+ T cell population is consistent with the requirement for class I MHC and adherent cells capable of cross-priming as observed in Figs. 2⇑ and 3⇑. In other systems, the requirement for CD4+ Th cells in the activation of CD8+ effector cells can be bypassed by activation of CD40 on dendritic cells (19). As shown in Fig. 6⇓, the requirement for a CD4+ T cell in the transfer of tolerance was overcome when an agonistic anti-CD40 Ab was also injected with the CD8+ T cells. Adoptive transfer of tolerance. T cells from mice tolerized 5 days earlier with TNP-spl were isolated from spleen. CD4+ and CD8+ T cells were obtained by negative selection. Cells were then transferred to mice immunized 4 days earlier with 1% TNCB. One group received anti-CD40 plus CD8+ T cells and one group received anti-CD40 alone. Mice were challenged immediately following transfer with 10 mM TNBS in the right footpad and PBS in the left footpad. Measurements (micrometers ± SE) were taken 24 h later and represent the difference between right footpad (Ag challenge) and left footpad (PBS challenge). *, Significantly different from immune control. The i.v. injection of Ag-coupled spleen cells is a potent method for induction of Ag-specific unresponsiveness. In this work we present evidence for a sequence of events that accounts for the effect. Upon injection of the cells, FasL in the host induces apoptosis by interaction with Fas on the injected cells. This requirement for Fas/FasL interactions can be bypassed by directly inducing apoptosis in the injected cells. The hapten-coupled apoptotic cells are then engulfed by CD8α+CD11c+ splenic dendritic cells, which cross-prime CD8+ T cells via presentation of haptenated peptides on class I MHC. The CD8+ T cells regulate the immune response with CD40/CD40L-mediated help from CD4+ T cells. Our results are also consistent with the idea that immature dendritic cells are responsible for transducing the tolerogenic signal, because injection of a maturation signal in the form of anti-CD40 Ab induces immunity. A recent report showing that that immature dendritic cells tolerize recipients and induce regulatory T cells in humans (14) also supports this idea. Recent studies have suggested that exogenous Ags are presented in association with class I molecules on dendritic cells to effector CD8+ T cells (23). These cells were identified as CD8αhighCD11chigh lymphoid-derived cells residing in the periarteriolar lymphatic sheaths. Another population of splenic dendritic cells that is myeloid derived (CD8−) resides in the marginal zones (25) and does not appear to be involved in CD8 T cell priming. It is interesting that the same cells (CD8αhighCD11chigh) that cross-prime CTLs also cross-prime regulatory T cells. 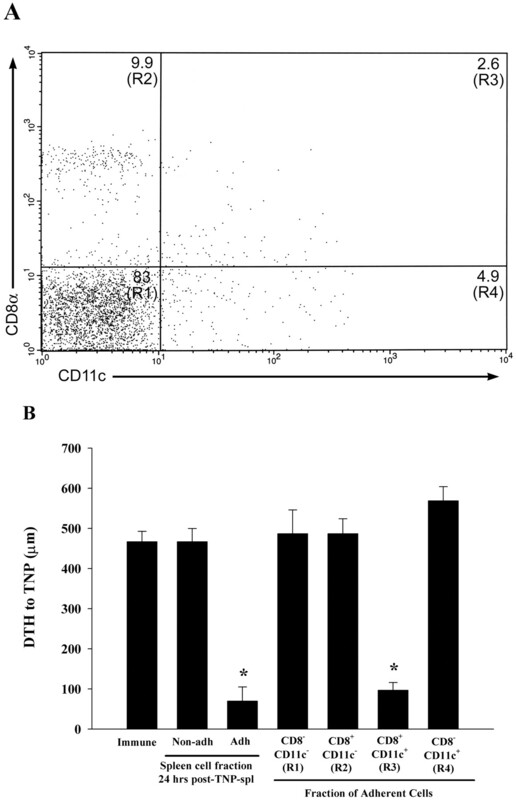 This dendritic cell population is extremely effective in transducing a tolerogenic signal. Only ∼1% of spleen cells are adherent by our method and the CD8α+CD11c+ cells comprise ∼2–3% of this population. Therefore, only 0.002–0.003% of the cells in the spleen cells appear to be responsible for the observed effects. This is similar to the recent findings of den Haan et al. (23), who found only a small percentage of cells isolated from the spleen contained Ag for cross-priming of CTLs. Fundamentally different roles for CD40 stimulation were seen when we examined the induction of tolerance and the transfer of the CD8+ T cells from the tolerant mice. Whereas combination of CD40 activation with tolerogen yielded immunity, activation of CD40 was required for the inhibitory effect of the CD8+ regulatory T cells. Although these results may seem paradoxical, in a broader context they may make intuitive sense. Apoptosis occurs in normal tissue turnover and homeostasis, and we would expect that Ag associated with these apoptotic cells is tolerogenic. However, if apoptosis occurs during infection, additional signals that are present can activate the dendritic cells and immunity ensues. This was mimicked in our system by agonistic anti-CD40 Ab. However, if tolerance to the Ags has been established by prior exposure, subsequent contact results in activation of regulatory CD8+ T cells that prevent induction of potentially dangerous immune responses. This is now enhanced by the presence of the CD40 signal on the dendritic cells that activate the CD8+ T cells, via either activated CD4+ T cells or agonistic anti-CD40 Ab. Transduction of tolerogenic signals between regulatory T cells by dendritic cells was reported a number of years ago (26); therefore, it is possible that this represents the activation of the dendritic cell to present Ag to the regulatory CD8+ T cells. Cognate help between CD4+ helper cells and CD8+ CTLs activated by cross-priming has been shown to occur via CD40L stimulation of dendritic cells (27), and this appears to be the role of the CD4+ T cell in the present system. Whether the CD4+ T cells have a particular cytokine profile, e.g., Th1 or Th2, is not known. However, in a similar system where CD4+ cells and CD8+ T cells cooperate to mediate tolerance, the CD4 cells are the Th2-like and result from the differentiation Ag presentation in the presence of apoptotic cells (28). We are currently performing studies to characterize the role of CD4+ T cell in the present system. The mechanism of action of the CD8+ regulatory cells is not known. One possibility is that these are Tc2-like cells, producing inhibitory cytokines in response to antigenic stimulation (29). To address this possibility we have tested CD8+ cells from tolerized mice for candidate cytokines by ELISA and intracellular cytokine staining. These tests have not shown a discernable pattern for the production for IL-10, TGF-β, or IL-4 that could account for the observed effects. Even Ag restimulation in vitro failed to produce detectable differences between tolerized and nontolerized animals (data not shown). Alternatively, the regulatory CD8+ T cells may be cytotoxic cells that effectively destroy APCs bearing the appropriate ligand. To test this we examined tolerance induction in perforin knockout mice (30). We found that these mice were easily tolerized by irradiated TNP-spl and contain regulatory CD8+ T cells (data not shown). These data, coupled with our results showing that FasL-defective gld mice are tolerized by irradiated TNP-spl (Fig. 1⇑A), suggest that cytotoxicity mediated by perforin and/or FasL is not involved. Therefore, while CD8+ T cells appear to be important in tolerance induced by TNP-spl, the mechanism whereby these mediate their effects remain elusive. Tolerance induced by cross-priming of apoptotic cells has been described for CD8+ CTLs (31). In this situation, tolerance is defined as unresponsiveness in the CD8+ population. Our data show the CD8s obtained from cross-priming are regulatory cells. In either case, it is unclear how the particular cross-priming conditions preferentially stimulate these cells rather than mediate immunity. Apoptotic cells externalize phosphatidylserine, and this activates a phosphatidylserine receptor present on dendritic cells, macrophages, and other cells (32), inducing the production of anti-inflammatory cytokines such as TGF-β (33). Apoptotic cells are also known to produce immunoregulatory cytokines before death (28, 34). It is possible that this helps to promote the induction of the regulatory T cells we have observed. A connection between apoptotic cells and the induction of tolerance has been observed in other situations. Systemic immune deviation elicited following Ag presentation via an immune-privileged site was recently shown to require Fas/FasL-mediated apoptosis, engulfment of apoptotic cells by APCs, and presentation to T cells (11, 28). Similarly, the induction of tolerance by hapten sensitization through UV-exposed skin involves the induction of CD8+ regulatory T cells, and this requires Fas-FasL interactions in the animal (12, 35). These systems resemble the phenomena we have studied here and may involve similar mechanisms. Conditions that result in the apoptosis of activated T cells can promote tolerance for graft rejection (36, 37), and expression of antiapoptotic Bcl-xL in the T cells prevents this nonresponsiveness (36). This may be related to the phenomenon we have described in this work, provided Ags from the graft are somehow associated with the apoptotic T cells. In support of this idea, it was recently shown that T cells can take up, internalize, and re-present peptides associated with MHC-peptide complexes on dendritic cells (38). Our results not only extend current paradigms on the role of apoptosis, dendritic cells, and regulatory T cells in immune tolerance, but they also provide a mechanism for one of the most studied, but least understood, modes of inducing Ag-specific unresponsiveness. Further studies into signals that induce immunity or tolerance, as well as insights into the mechanism of maintaining the tolerance state, may help solve some of the more perplexing questions in autoimmunity and transplantation tolerance. ↵1 This work was supported by National Eye Institute Grants EY06765 and EY08972 and by a Department of Ophthalmology and Visual Sciences grant from Research to Prevent Blindness, Inc. (New York, NY). ↵2 Current address: Department of Urology, University of Iowa, Iowa City, IA 52242. ↵4 Abbreviations used in this paper: FasL, Fas ligand; CD40L, CD40 ligand; TNP, trinitrophenyl; TNP-spl, TNP-coupled splenocyte; β2m, β2-microglobulin; TNCB, 2,4,6-trinitro-1-chlorobenzene; TNBS, 2,4,6-trinitrobenzene sulfonic acid.